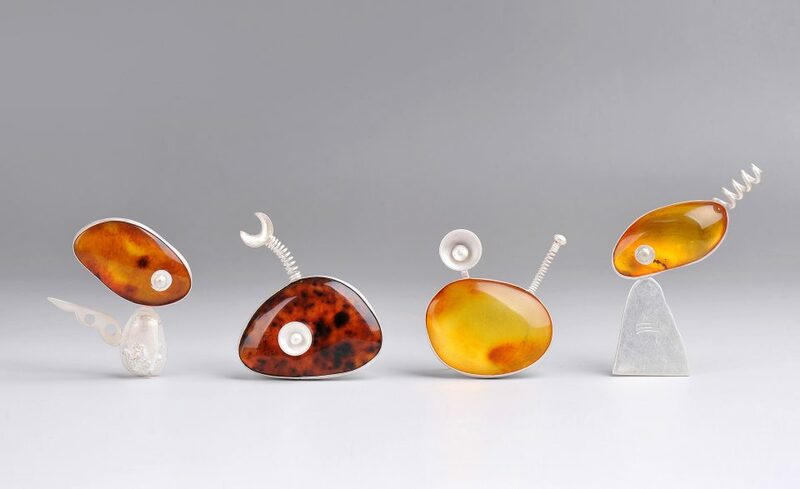 Jewellers and academics Elizabeth Shaw and Xiaohui Yang created a thoughtful exhibition of works as well as a long-lasting partnership that traverses China and Australia, and involves their many students. As a young Masters student of Interior Design at Griffith University’s Queensland College of Art in Brisbane, Xaiohui Yang produced a series of intricate and minuscule models. 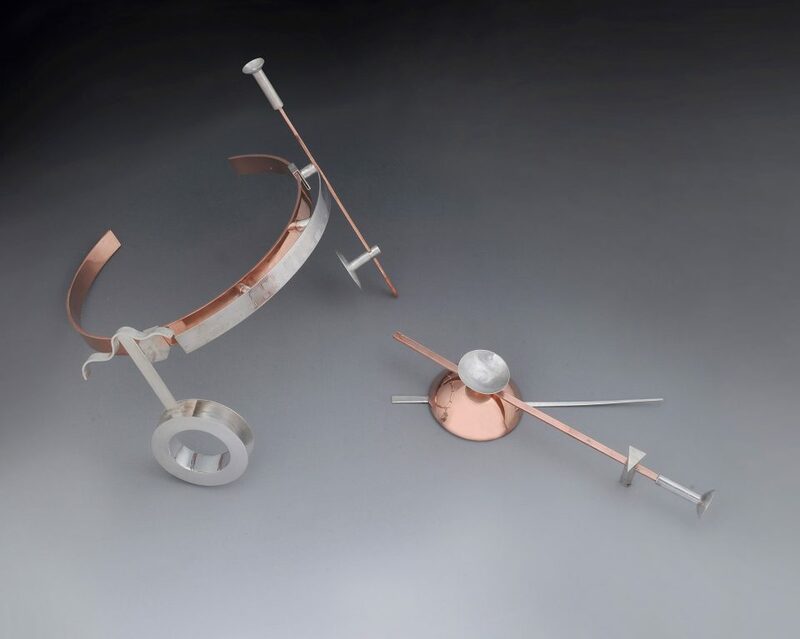 It didn’t take long for jewellery senior lecturer and practitioner Elizabeth Shaw to realise Yang might be better suited to the study of Jewellery and Small Objects. The two have since collaborated on an exquisite exhibition of works in Artisan gallery, Tales from the Studio: Yang+Shaw, that explores the relationship between body and object. They have also begun an exchange between their two universities, Shandong University of Art and Design and Griffith University’s Queensland College of Art, that incorporates education programs for their respective students. Tales from the Studio: Yang+Shaw will tour Australia and China over the next couple of years. Here they discuss ideas and shared histories with More Margie. In 2013 we organised an exchange exhibition of our students’ works. Liz came to my university as a guest at the 40th anniversary, and to help set the exhibition up. I showed her the works I had been making and she suggested we could have an exhibition together. In 2015 when I went back to QCA as a visiting scholar Liz mentioned the exhibition idea again. Xiaohui Yang Handshake Salute 2010, ceramic, 12 x 6 x 6cm. Photographer: Wang Bing. Xiaohui Yang Fist-and-Palm Salute I 2010, ceramics, 12 x 6 x 6cm. Photographer: Wang Bing. Xiaohui Yang Two vs Victory 2010, ceramics, 11 x 6 x 5cm. Photographer: Wang Bing. Xiaohui Yang Fist-and-Palm Salute II 2010, ceramics, 11 x 6 x 6cm. Photographer: Wang Bing. Firstly, I believe that the physical act of making has an essential role to play in an increasingly virtual world at this time. Therefore, I decided to study jewellery and small objects in visual arts. Secondly, I see jewellery as a link between body and soul, because it is something that can directly reflect and influence our behaviors and relationships that other mediums cannot. Elizabeth — you are an avid collector and integrate elements of your collection into your work. How extensive is your collection of found objects and how and why do you like to incorporate it in you jewellery? My works start with a collected or found broken part of an object that brings with it a history. I embellish the history through additions of other elements. The types of collected items I like to incorporate in my work, are broken valueless discards, quite often things that have been landfill, things dug up in my garden, or things crushed and broken on roads. These are symbolic of our approach to stuff in our society, we are surrounded by items that are readily discarded with no hope and often no desire for repair. The found items form a part of the narrative of my work. I repurpose them and embellish their story through the addition of reused or recycled sterling silver. 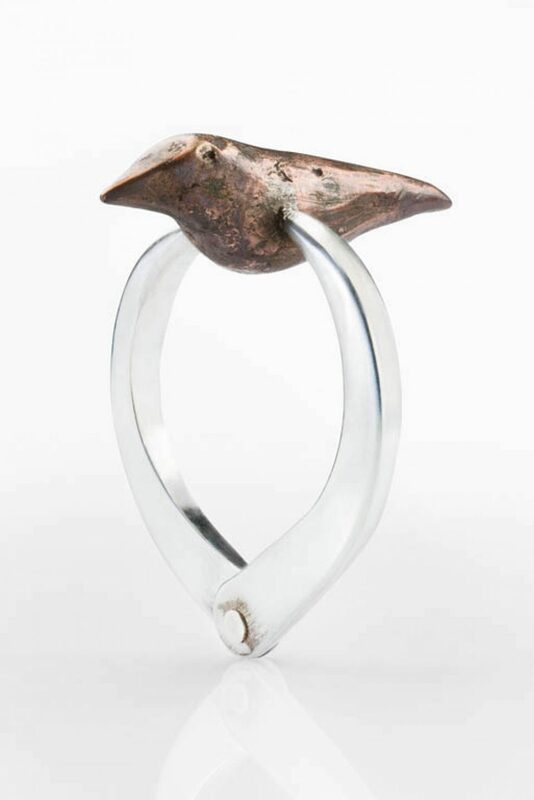 Elizabeth Shaw Diver 2014, found terracotta figurine, recycled and reused sterling silver, pendant (6.5 x 2 x 1.5cm), dimensions variable. Photographer: Michelle Bowden. The first reason that I follow an academic career on my return to China is that I am interested in comparing and contrasting the jewellery between China and Australia, as long as I have the jewellery making experience gotten from Australia, and some Chinese handcrafts history knowledge. The second reason is that there is great number of students in China who are desperate for different knowledge from different cultures to open their horizon. Therefore, I am willing to keep doing my research and share my experience with the students in China. Elizabeth — discuss your theory of the association between the body and jewellery. I am drawn to work in the field of jewellery because of its association with the body. Archeological finds have identified beads dating back 100,000 years. These have been interpreted as a sign of complex figurative thought, established social structures, trade, a sense of social and personal identity and an ability and desire to communicate. Jewellery is made as an extension of the body, something we add to ourselves. It is a material way to present ideas, to communicate internal thoughts and perceptions. I like to play with this understanding. My work is sometimes confronting in its lack of conformity to social mores of jewellery. 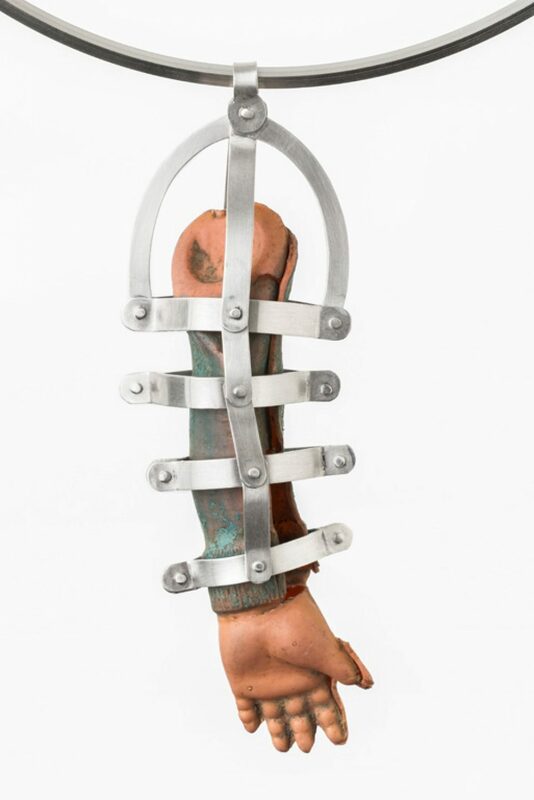 Elizabeth Shaw Braced Figure 2015, recycled and reused sterling silver, found ceramic, doll’s hair, titanium, pendant (8 x 2.5 x 3cm), dimensions variable. Photographer: Michelle Bowden. 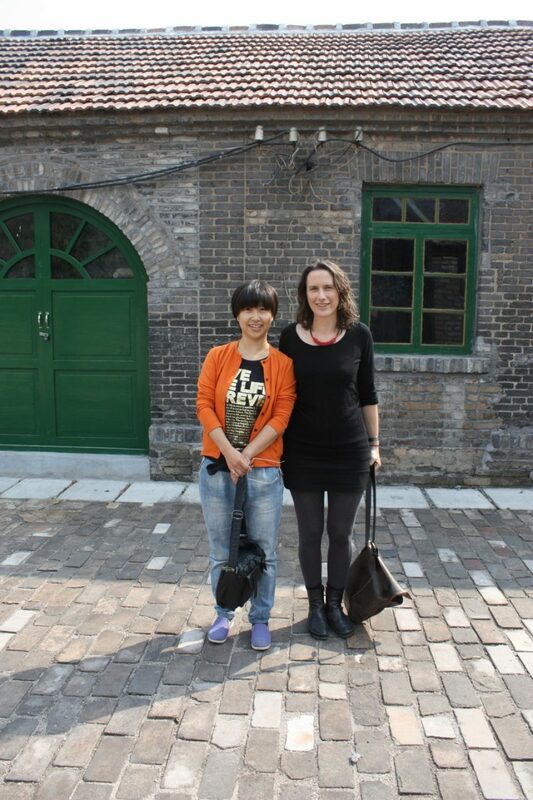 Liz and I are planning an Oversea Study Tour between Griffith and Shandong College of Art& Design in 2016. This activity allows students to achieve first hand information from a different education system and they will have an opportunity to experience a different culture. 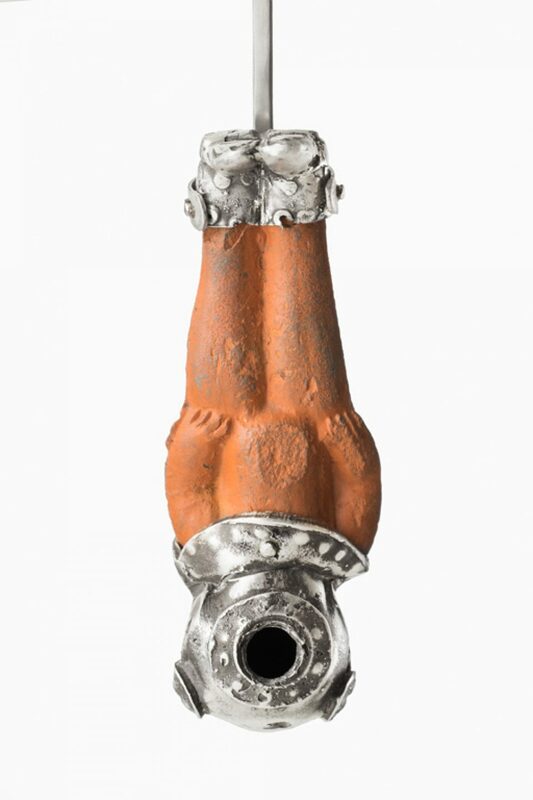 Xiaohui Yang Seek Curiosity 2013, silver, Chrysophoron, 7 × 6, 7 × 5, 6 × 6, 7 × 6cm. Photographer: Bing Wang. Elizabeth — how do your students, and Xiaohui’s benefit from exchange programs between your two respective universities? Students are necessarily focused in their studies and benefit from experiences that expand their thinking. It is important for students to get an idea of how their work stands up outside of the comfort of their learning environment. It is an extraordinary experience for any artist to exhibit internationally. For our students to do so, it is a significant achievement before graduation. 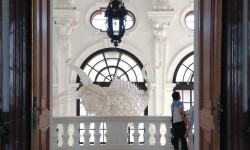 The works from both universities are exhibited together in both countries and it is exciting to see that there are similar ideas explored, similar concerns, and similar materials. The students can see that there is a dialogue between their artworks. 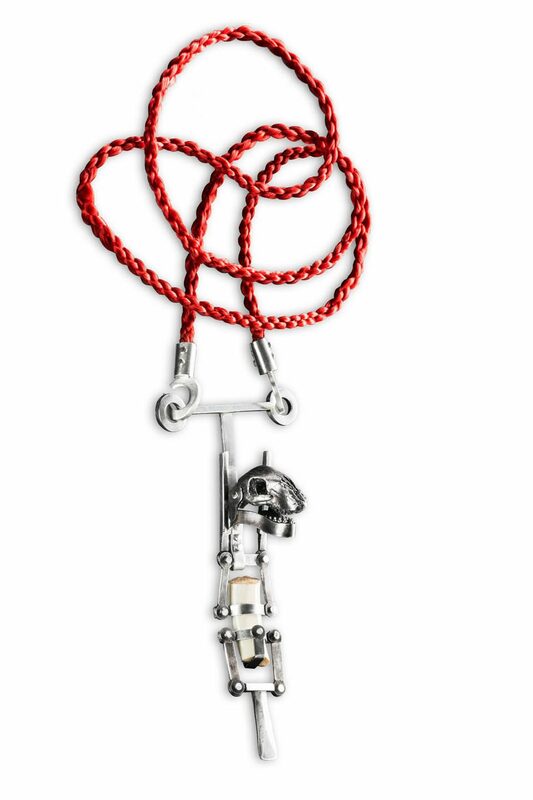 Elizabeth Shaw Caged Arm 2014, found plastic arm, recycled and reused sterling silver, pendant (9.5 x 3 x 2), dimensions variable. Photographer: Michelle Bowden. Lisa Bryan-Brown is Curatorial and Collections Officer of Griffith Artworks at Griffith University. Here she shares her wonderful catalogue essay Extensions on the exhibition at Artisan Gallery in early 2016. Taking the body as their point of conceptual departure, both Xiaohui Yang and Elizabeth Shaw create works that explore human interrelationships and socio-cultural issues. The two are lecturers in contemporary jewellery and small objects at their respective universities— Yang at Shandong University of Art and Design, Shaw at Griffith University’s Queensland College of Art (QCA)—and they met in 2008 while Yang was completing her Master’s with Honours at QCA. When Yang returned to China, their critical dialogue continued through correspondence, and, in 2013, they worked together to curate NOW: The Start of a Conversation, an exchange exhibition of their graduate students’ work. Tales from the Studio is the first time that the pair have exhibited their works together, and it reveals the distinct trajectories of each artist’s practice despite their shared academic concerns. While the role of the body is important in the conceptual resolution of both Yang’s and Shaw’s works, to position their practices within a framework of jewellery would incorrectly privilege notions of adornment over their nuanced approaches to the body as a performative site for artistic installation. For both artists, the wearer plays an active role in the realisation of the artwork, giving it function and context. 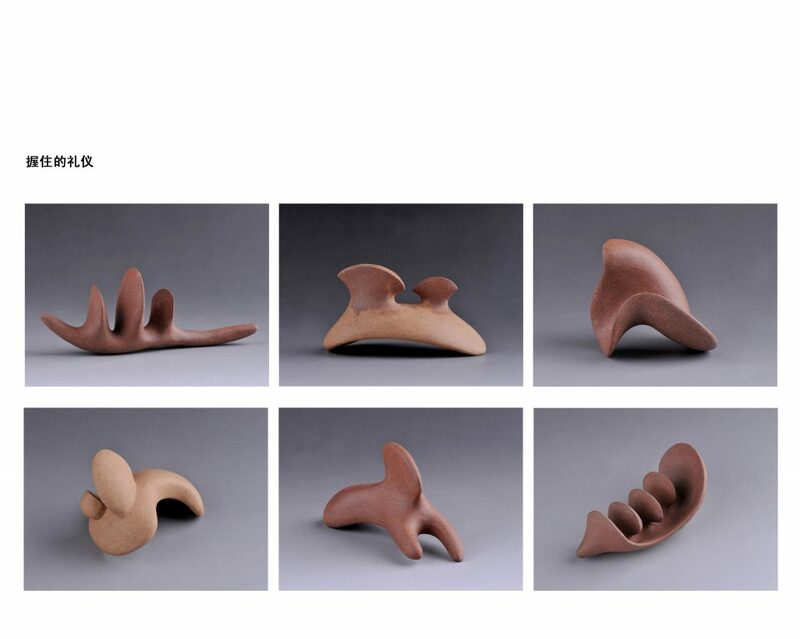 Yang’s practice is broadly concerned with exploring culturally informed differences and similarities in human interaction. 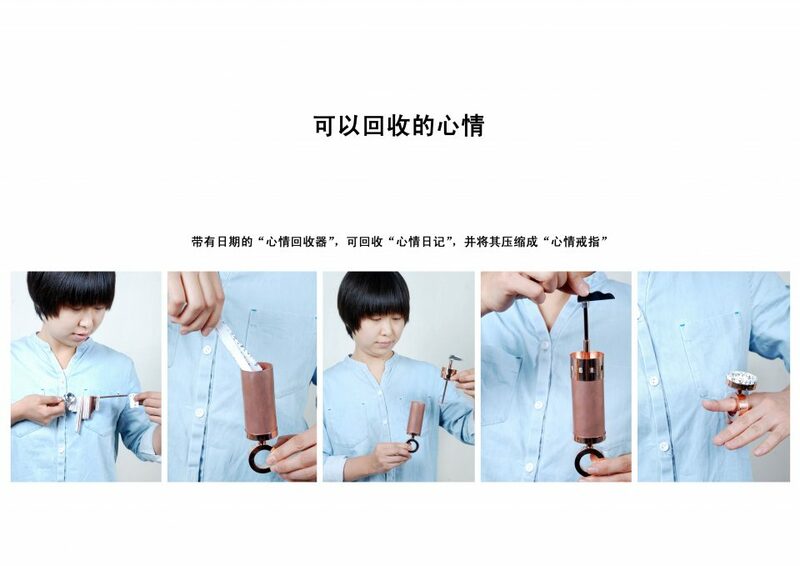 Her Hold the Etiquette series contemplates the handshake, a distinctly Western greeting that is now dominant internationally, and increasingly prevalent within China specifically. Made to be held, each ceramic form fits snuggly with the hand, exploring the notion of touch through the language of form. Yang’s Relationship Measurement rings consider the social mores surrounding personal space and physical interaction. They act as a tape measure; anchored to the wearer, the rings quantify the distance separating them from their companion. Her Distance of Sense Organ pieces operate similarly, measuring distances between different points of perception on the wearer’s own body—their eyes to ears, or heart to mouth. Shaw works in response to found objects she has collected over time; some hold sentimental value, others were found serendipitously, and many were acquired through friendships with other artists. Innately attracted to broken or incomplete objects already imbued with history, Shaw intuitively ‘mends’ the found component, augmenting it in order to reconcile its form and orient it within its new context. Activating these damaged objects through narrative (e.g., Rotary Sickle and Bird), mechanism (e.g., Tapper Ring) or prosthetic (e.g., Diver), each piece precipitates a distinct personality. By repurposing her collected materials, Shaw engages with a culture of repair and reuse that is consistent with the ethics of making and sustainability that underlie her practice. Tales from the Studio reveals the common threads that exist between Yang’s and Shaw’s practices. United by their approach to body as both a site and a subject, the artists extend the body in order to make sense of it: Yang the bodies of her wearers, Shaw the bodies of her objects. Thoughtful and critically reflexive, their works engage with issues pertinent to contemporary jewellery and object-making practices. 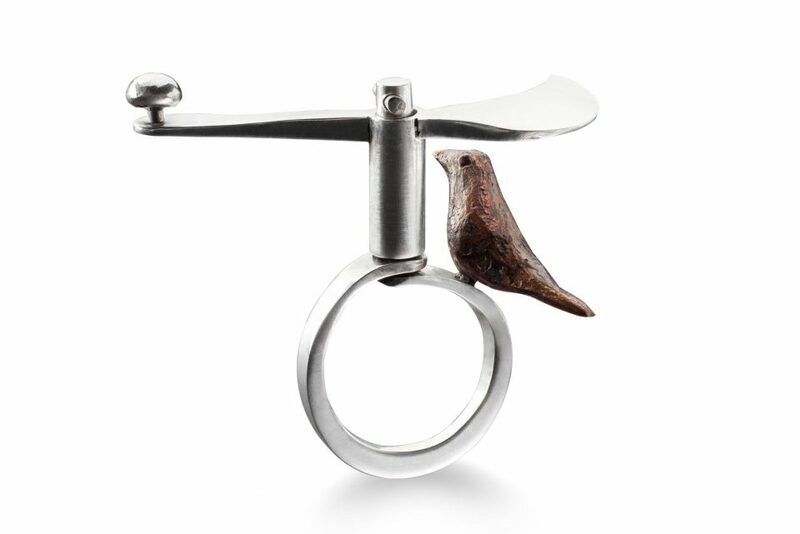 Elizabeth Shaw Rotary Sickle and Bird (ring) 2015, recycled and reused sterling silver and bronze, 4 x 0.5 x 3.5cm. Photographer: Michelle Bowden. 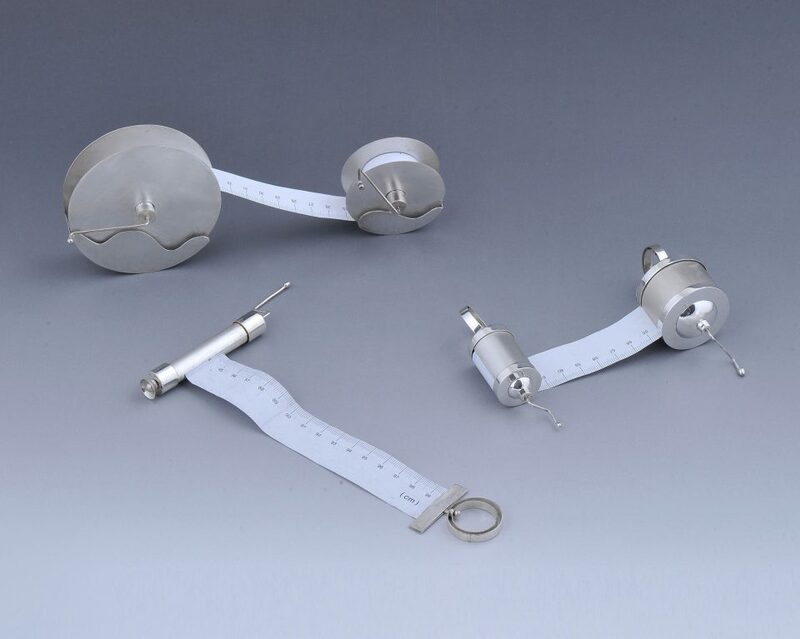 Xiaohui Yang The Distance Between Us 2012, silver and paper measuring tape, 19 x 9, 9 x 7, 9 x 3cm. Photographer: Bing Wang.